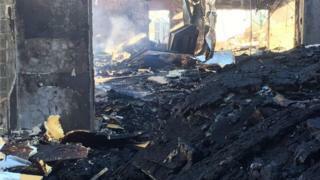 An investigation has begun into the cause of a fire that badly damaged a derelict youth club building in Londonderry. Fire crews were called to the former St Mary's Youth Club in Fanad Drive in the Creggan area of Derry at about 21:00 GMT on Saturday. Five Northern Ireland Fire Service pumps and an aerial appliance were sent to the scene. Demolition work has been ongoing at the former youth club building. Sinn Féin councillor Kevin Campbell said he had previously raised concerns about the security and safety of the site. "During the past week I spoke with all the various agencies and spoke with residents to let them know what I had been doing on the issue," he said. "I also put out a number of public appeals for parents to ensure that their children were kept away from this building and the obvious dangers the site presented." He said it was imperative that the building is "demolished and the site cleared as quickly as possible."